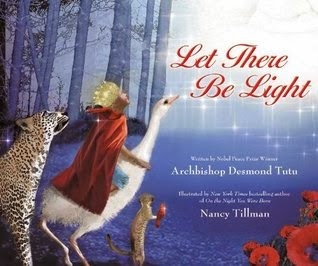 Let There Be Light combines the love and warmth of Nobel Peace Prize Winner Archbishop Desmond Tutu with the extraordinary talents of bestselling author and illustrator Nancy Tillman. This retelling of the biblical story of creation vividly portrays the wonder and beauty of God's creation on each of the seven days. Using Archbishop Tutu's lyrical text from the Children of God Storybook Bible and Tillman's remarkable illustrations, Let There Be Light brings the story of creation to life for readers young and old. My thoughts: The illustrations are absolutely gorgeous. They are full of vivid colors, which will really grab a young one's eyes. The text tells the creation story in a simple manner. This book would be perfect for a really young one and would really serve as the perfect introduction to the creation story and who God is. Most children's Bibles are complex enough that a two-year-old may not understand or fully comprehend, but this book is so simple. It would be a great Easter or Christmas gift. I'm stowing my copy away to give to Bug at a later date as a gift.